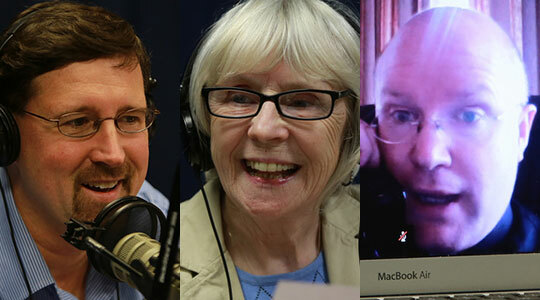 Summary of today’s show: Scot Landry, Susan Abbott, Fr. Roger Landry, and Gregory Tracy discussed the news headlines of the week, including the installation of the new rector for St. John Seminary; the ordination of 10 men as permanent deacons, including the first from the Brazilian community; insight from Mother Teresa’s close friend; Cardinal Seán’s op-ed on assisted suicide; and humor and joy in the New Evangelization. 1st segment: Scot Landry welcomed everyone to the show. He told Susan Abbott that today is the Feast of St. Vincent de Paul, who is one of his favorite saints. Scot welcomed Fr. Roger Landry and Gregory Tracy back to the show. Scot asked Fr. Roger about his pilgrimages to Spain and Lourdes, France. He said he started ith a visit to friends, then went to Fatima, Portugal, then to Spain for a priests’ retreat, then to Lourdes. He also visited several shrines of martyrs and saints and dedicated to Mary. His retreat helped him to prepare for the Year of Faith. He was with 28 Spanish priests on the retreat. Scot asked what is was like to now visit Lourdes as pastor of St. Bernadette Parish. He said that he prayed for a blessing on his new mission and his parishioners. Fr. Roger said he contemplated anew St. Bernadette’s example of praying the Sign of the Cross, not simply making the Sign of the Cross before beginning prayer. Turning to local news, Msgr. James Moroney was installed as the 20th rector of St. James Seminary. Scot noted that he was the first rector who is a diocesan priest not of the Archdiocese of Boston. He also has a worldwide reputation as an expert in the Liturgy. Greg noted that Msgr. Moroney was instrumental in the new translation of the Roman Missal. He noted that the monsignor began his work in July and only now have they had the installation after the academic year has begun and on the family day in which many of the seminarians’ families were present. Scot said Msgr. Moroney is a wonderful homilist. Susan noted that the Cardinal said he was impressed by the monsignor’s joy and love of the priesthood. Some of you began God’s holy work of forming priests … in other holy houses … where mothers and fathers taught sons how to make the sign of the cross … how to love as Jesus first loved them,“ he said. ”Some of you are their pastors and priests. You so moved them by the dedication of your lives that these men wanted to be just like you. You inspired them to become other Christs… Some of you are their bishops who have confided them to the care of this venerable seminary,“ he said. ”Here, men learn … to live as holy priests. They learn to preach, to administer the sacraments, and to set the world on fire with divine faith … to draw all people to Christ." Fr. Roger noted that the rector is a model and the master. It’s a significant appointment. He said when a rector isn’t very good, there are many men who leave the seminary and even those who are ordained will sometimes leave after a few years because they were badly formed. On the other hand, he noted Cardinal Hickey who formed many men who are bishops and cardinals today. Also in the Pilot are two stories on the ordination of 10 men to the Permanent Diaconate. The newly ordained deacons are Deacons Robert C. Balzarini, Vincent Gatto, James T. Hinkle, Michael C. Joens, Jonathan Jones, Brian K. Kean, Thomas O’Shea, Louis J. Piazza, William K. Reidy, and Paulo Torrens. Scot said Torrens is notable because he is the first permanent deacon ordained in the Archdiocese who is from the Brazilian community. Greg said he knows Cardinal Seán is very excited by this development. The Brazilian community is a very large group within the Archdiocese. Scot said the deacons will have a dual ministry in parishes and in offices of the Central Ministries. Scot asked Fr. Roger about the trend of immigrants becoming permanent deacons. Fr. Roger said in the Southwest US you see a lot of immigrant permanent deacons. In the Northeast it’s still relatively rare. Practically speaking, most deacon programs require an academic component and in many cases these men are hardworking blue-collar workers without a college degree. Deacon Torrens already has a Master’s degree in psychology, which helped a lot. He said having immigrant deacons is helpful because it makes it easier for someone from the culture to pass on the faith. Scot said last week a close collaborator with Mother Teresa spoke at the Cathedral of the Holy Cross. Msgr. Leo Maaburg wrote a book on her life from his perspective as a friend. Susan said he said that he had admired her wit and fiery nature. Greg also said Msgr. Maasburg talked about how Mother Teresa saw abortion as a threat to world peace. Fr. Roger said Mother Teresa also put love for others at the forefront of everything she does. Scot asked Greg about the appointment of his pastor at Our Lady of the Assumption in East Boston also as pastor of St. Benedict Parish in Somerville. He remains pastor of both parishes. Greg said he’s been pastor in East Boston for the past five years and has put a lot of time in on the physical restoration of the church. He’s also brought back a lot of life to the parish in terms of sacraments and programs. Also in the Pilot this week is a complete list of all religious sisters celebrating jubilees this year, from a recent Mass in their honor. Scot said 16 are celebrating 75 years, 16 celebrating 70 years, 12 celebrating 65 years, 65 celebrating 60 years, 35 celebrating 50 years, and 6 celebrating 25 years. Susan noted the sisters that she knew herself. She said she wish they had listed their religious names they had before the changes of Vatican II because she only knows many of them by those names. Fr. Roger said the numbers show us that most of the older sisters were born in the Great Depression and were teens in World War II, who saw the commitment of the Greatest Generation and saw how they could sacrifice for a greater cause. This was a generation not afraid to make commitments. It was also a time that the Church was very vigorous and there was a lot of work for religious sisters. He said it also shows that the lifestyle of religious sisters is a very healthy one, which helps them to be long-lived. He noted that even the Golden Jubilarians were also not Baby Boomers, being born in the 1940s. He said culture and the time we live has a huge influence on vocations. Greg nboted that this is an annual Mass that was always at the Cathedral until it was closed for renovations in 1997 and has since then been at St. Theresa’s in West Roxbury. 2nd segment: Scot said in this week’s Pilot, Cardinal Seán has another op-ed on assisted suicide. This one focuses on the idea that we would never endorse suicide in other aspects of life. Greg said the cardinal writes that when someone says they are depressed we don’t approve of them killing themselves. How can we say suicide is fine in some circumstances, but for a depressed teen, for example, it’s not. Susan notes that name of the op-ed is also the name of the website with many good resources. She said our society has so many resources to prevent suicide, but yet we’re saying it’s okay. Scot said Mass. Gov. Deval Patrick said this week that he leans toward approving of assisted suicide. He wouldn’t want it for himself but wouldn’t want to impose it on others. Fr. Roger said he would ask the governor if he’s in favor of providing nooses in public high schools to give the option to depressed students. Would he be in favor of the option for them? Of course, the governor would say no. The real question is whether suicide is a tragedy or not. Proponents try to claim that it is not a tragedy. It’s just someone accepting they’re already dying and trying to die less painfully. But we’re all dying from the moment we’re born. Fr. Roger added that the US government issued a report that the suicides have passed car accidents as the leading cause of death by injury. From 2002 to 2009, suicides grew by 15%. So what will the government’s response? Is it going to say that it’s a good and moral thing to do? He would ask Gov. Patrick if he’s ever been to the funeral of someone who committed suicide and recognized that it’s never a celebration. Scot said that even for those support the idea of physician-assisted suicide, this particular law is a bad law because it has too few safeguards like notifying spouses or having doctors involved. Scot responds to proponents that suicide has collateral damage; this type of suicide requires accomplices, including pharmacists who don’t have conscience exemptions as well as the person who has to help the patient take the 90 pills; and it is hypocritical about suicides for other people. act that only affects the individual involved. Family members, friends and neighbors often are filled with lingering sadness, guilt and confusion. Sometimes those who are closest to the deceased never completely recover, never forgive themselves and are haunted for the rest of their lives by the loss. thoughts. Many volunteers stand ready on their hotlines, always prepared to try to bring solace and help to those suffering from suicidal impulses. Samaritans and to work to prevent suicides in our community. I’m against the death penalty in general, even for those found guilty of serious crimes beyond a reasonable doubt, so why should I be in favor of it being facilitated by private doctors on innocent, if suffering, individuals, even if they request it in a distraught state? Greg liked how Duncan approaches the topic in plain language. Scot notes that Fr. Roger’s column is entitled “Humor and joy in the New Evangelization.” Fr. Roger said Fr. James Martin had asked comedian Stephen Colbert to participate with Cardinal Timothy Dolan in a forum on the topic of humor and joy in the New Evangelization. More than 3,000 Fordham students waited overnight to get tickets. Fr. Roger said that the result is the idea that at end of our story we are living a comedy, not a tragdy. He encouraged listeners to seek out the remarks from the forum to read what was said there. Susan also encouraged listeners to go read Fr. Roger’s column from last week on the Sign of the Cross and Scot encouraged everyone to read Fr. Martin’s book on humor in the Christian life.